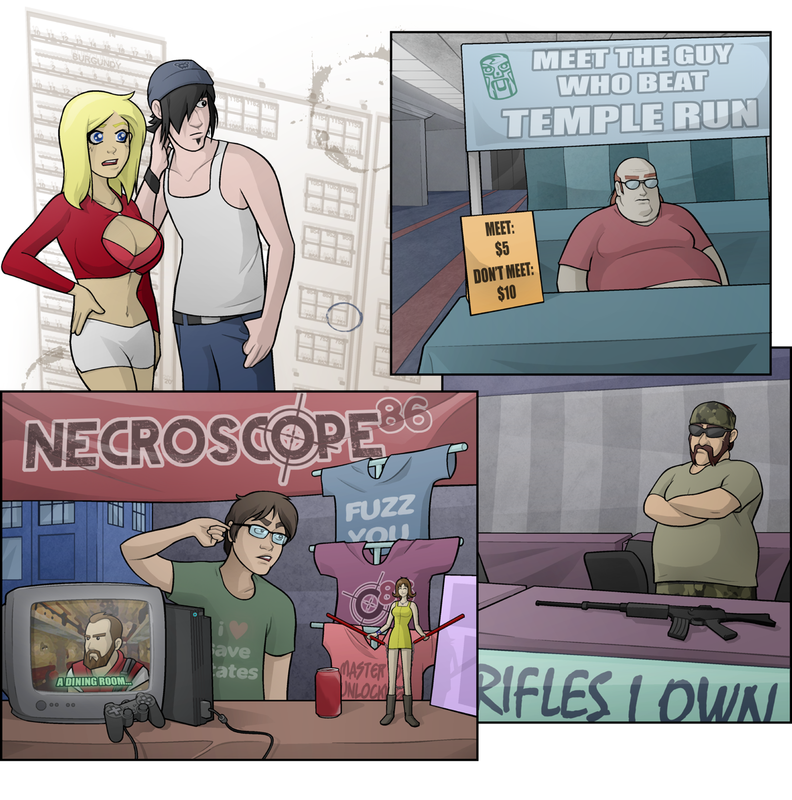 This comic highlights the more absurd and/or niche booths you’ll see at conventions. They all have em. Jessica can elaborate on the final panel since that’s her own anecdotal addition to the comic today. She had no idea why, but someone just had a single rifle on a table. I also wanted to use a real Youtube Let’s Player as an example, versus a ficticious one, and the real Necroscope86 was kind enough in allowing me to use his channel name and likeness in the comic. If you’ve never checked him out, I certainly suggest you do. He’s a retro gamer, and highly likable in his commentary. Ellie might have a bright future in convention marketing. She not only gets layout but she’s also a major draw in her own right. LOVE the “meet the guy who beat Temple Run” dude. Reminds me of that old “Married With Children” episode when the Bundys went to “Poppy’s By The Tree” in Dumpwater, Florida. There, the biggest attraction was to meet the man who met Andy Griffith. At least, until the serial killer thing got started. Second, let’s play videos. Well, they can be fun, I admit. I’ve enjoyed Two Best Friends Play more often than I probably should admit. But yeah…not really convention fodder. All told..wow. Awesome piece today, Rusche. And if this is still first comment, I’m gonna be amazed. I have to wonder if Ellie picked up any of that convention business savvy from Pumpkin. “Conbizsav”? Also, I know the two-part episode you’re referring to, and it was hilarious. I’d imagine Pumpkin’s interests helped, but Ellie does have fairly strong social and mercantile awareness in her own right too, so I’d imagine some of it is innate also. With great rack comes great… What were we talking about? Where’s the line to not meet the guy who beat Temple Run? Pack a lunch; it’s around the block and out past the Magic Kingdom by now. What?! But I dont have $10 to spare! Panel 2 and 4 are some of the reasons I hesitate at the idea of going to any cons. Just don’t go to the purgatory, and you’ll be fine. OMG! You’re right! That’s clearly him. Haha that last panel….I dunno but it got me. Ellie seems very updated on “all things Con”.. perhaps having pumpkin as a sister means the knowledge just kinda rubs off on you…. Ellie is used to being the center of attention and using her natural assets for her benefit. It’s not unbelievable to me that she has developed an understanding of what it takes to get noticed. I agree that Ellie likely has some natural awareness in the area, but based on Pumpkin’s exhibited mannerisms and speaking tendencies, I’d imagine she’s probably talked out her business frustrations and/or con experience with Ellie. And Ellie probably at least half paid attention to some of it (unlike Cinn), so she’d have a few Pumpkin horror stories to help spot the highs & lows. Hmmm I wonder, does this display of knowldge come from her experience at previous jobs, or is it just her from years of experience in getting attention? Think about it, she is a very attractive young woman, but getting and keeping attention on yourself takes more than looks. It takes a good understanding of human nature and awareness of your surroundings. Ellie is hot, but if she was at say a Victoria Secret runway pagent, she wouldnt stick out or be noticed at all, she’d be invisable just from blending in with her surroundings. I posted this when I visited Emerald City Con in Seattle. Table/booth with nothing except one sniper rifle on it. I remember hearing Dominick Keating from “Star Trek: Enterprise” describe one of the high points of his career as going to a convention and running into families with three children under seven dressed in Star Trek uniforms. “Keep ’em comin’,” was how he put it, if memory serves. Oh, but did you see the whole family dressed as the Belchers from Bob’s Burgers? That was actually one hell of a cosplay. Not only did they look remarkably like the characters, but the kids were the right ages to be Tina, Gene, and Louise! Although my favorite ECCC moment was seeing a tiny, ancient Asian grandmother dressed up as a Totoro, escorting her grandkids through the con and apparently having the time of her life. So there were fun moments. But there were also odd/creepy ones. In the “niche booth” section, there was a group of Christian Proselytizers with a “Jesus loves Gamers” theme, handing out Christian video game swag and trying to teach people how save souls and spread the word on livechat. Right next to them was a company that sold furry erotica and fursuits, happily demonstrating through mime the various adult activities that could be performed while wearing said fursuits. There isn’t enough brain bleach in the world to get rid of the mental image of what the booth guy did with a decapitated cartoon animal head. What was truly disturbing was the amount of crossover between congoers who enthusiastically lined up for both the Jesus Loves Gamers booth and the Fursuit booth. Gamers don’t need to save souls, just progress. If it was just one gun, then isn’t the banner declaring “Rifles (plural) I Own” a bit misleading? If the table is called “Rifles I Own,” then why is there just one rifle? Shouldn’t the table be called “The Rifle I Own”? Will I be shot just for asking these questions? Thats what makes it funny. Its ONE. It’s like the Wayne’s World gun rack speech. Oh, haha, I just made the same comment in reply to Jessica. Great minds thing alike? Perhaps they are displayed chronologically rather than spatially? Each day brings a new gun and it’s unique story. Everyone has to start small. Ellie is showing a bit of her Tarra side. We knew it was there. It just took a little time and maturity to bring it out. Rusche did say a couple of posts back that Ellie was basically just a laziness-dampened/reduced Tarra, so it makes sense. Mr. Blue blames the process on the wearing of the banned slutwear. Thinking about it, if this is merely convention Purgatory, then where is convention-Hell? I once had a ball pen stolen from a conventions men’s room. Left it lying next to the washbasins while taking a leak and it was gone when I came back. Mind you, it was a good pen, but a cheap one. Worth a few dollars if new and that one was old. Who the heck steals a cheap pen at a convention? Someone who needs an autograph from Patrick Stewart. That’s who. If you left it there it wasn’t stolen, it was picked up. It was stuck into my partially written on with notes con-program, not just lying around freely. And that program lying in the one place where you could place things while using the restroom and where everyone put down what they couldn’t take further into it. So “picked up” is not necessarily the expression I’d use. Come to think of it, for anyone who was guessing the Buckinghams were Catholic due to Rosemary’s crucifix and the sheer size of the family, this might be the tipoff. Who else would think Purgatory right away? Damn straight, D.E. I hate crowds. Particularly if they’re not hearing a no, D.E. I swear, looking back on it now, you can almost hear the banjo music. …I own the same Selphie Tilmitt action figure as the one shown in Necroscope86’s panel. I’m happy to see I’m not the only one to put her nunchaku in that position. Everyone else tries to set them up like traditional nunchaku, but they never want to stay in that position, and just end up falling out of her hands. I don’t know why I am sharing that information. I just felt like saying it. When it comes to LPers, I highly reccomend you check out Jesse Cox (OMFGCata). He’s funny, brilliant, and while he plays up the “not so very good” angle, he’s actually pretty clever when the chips are down (DXHR’s dlc, for instance). I’m not sure if I would agree that Ride to Hell is the worst game in history. If only because I’ve played some of the others that are considered for the position. Funny enough, Bad Rats isn’t one of those games. Probably because, having seen it in action and played some of it myself, it is so bad that you start to think that was the point, because it wraps back around to being hilariously entertaining in how bad it is. Go find yourself a copy of Athena from the NES. Even with save states it’s unbearable. Deadly Towers is equally insanely awful in its own right. Surely the horror that is E.T. is still in the running? You know, when I think about what would make a worse game than some of these, I start thinking about deliberately making a worse game. Then I realize, like Desert Bus, it would be deliberately omitted from such consideration. I was actually okay with E.T. when I played it. There were a few insanely hard Atari 2600 games so ET’s difficulty from inept programming didn’t make it stand out. Pitfall, Crystal Castles, and Raiders of the Lost Ark come to mind. Nope you all got it wrong the worst game of all time is Prayer Warriors: All Out for God. This reminds me of one time we had a panel-submission for our university-run Con. It was for a naruto-sasuke hybrid cosplayer talking about their inspiration and why they made a hybrid costume. Suffice to say, the submission was swiftly and jusitifiably rejected. Farnsworth: So what are you doing to protect my constitutional right to bear doomsday devices? National Ray-Gun Association Rep: Well, first off, we’re gonna get rid of that three-day waiting period for mad scientists. Farnsworth: Damn straight! Today, the mad scientist can’t get a doomsday device, tomorrow it’s the mad grad student. Where will it end? National Ray-Gun Association Rep: Amen, brother. I don’t go anywhere without my mutated anthrax… fer duck huntin’! Necroscope86? Surprised he hasn’t been sued by Brian Lumley yet. He’s said he asked the author if it was okay if he used the name Necroscope and Lumley approved. Wow. I’m surprised that interaction happened and went so smoothly! Most ip’s fire off the main lawyer battery the second you type in the second letter of the name. Now I want to go to Comic-Con just to see what an epic purgatory the mother of all Cons has…that and I just wanna go to Comic-Con. But I need to ask, because there is the essential of three possible things to bring. 3) A full tummy from having eaten at Taco Hell for every meal for the past two days. . . .
A fairly astute observation by Ellie. I would not have expected her to be this observant. Maybe all those jobs she’s held have been beneficial to her in other ways? By the way: Is that a Tardis? Hey! I used to follow Necro for a while. I liked him quite a bit- watched his videos everyday after work. I stopped following him after a while though. I spent more time telling my monitor “it’s right there!” than I spent actually enjoying the videos. I had gotten so absorbed in it, I got frustrated more easily than I had fun with the videos. Also, we have another great example of Ellie being not-just-another-pretty-face. She accurately surmises Danny’s problem, despite this being her first time at a convention (I would assume). I wonder- is this the result of her brief tenure as a manager or is she just plain clever and hides it well? I just wanted to say that I really appreciate and enjoy the map of the convention floor that is the background of the first panel. Simple concept, but wholly relevant and very well-executed. Hey, I can like comments now. Cool. Can’t downvote. Not that I’d need to. I just like options. You gave up your games for kids? I gave up being a parent to go back to my games. It was an obvious choice. I’m actually good at the latter.